The reason for the termination was a 2014 statutory amendment narrowing Spain’s universal jurisdiction statute  and Spain’s Supreme Court’s May 2015, decision upholding that amendment in its affirmance of the dismissal of a case investigating alleged genocide in Tibet. More specifically the dismissal of the Guantánamo case was required, said the judge, because the investigation was not directed against a Spanish citizen or a foreigner who was habitually resident in Spain or a foreigner who was found in Spain and whose extradition had been denied. Poder Judicial España, El juez propone archivar el ‘caso Guantánamo’ por “no ser competencia española” (July 17, 2015). Under customary international law and certain treaties, a nation state’s courts have universal jurisdiction (UJ) over certain crimes of international concern regardless of where the crime was committed or the nationality of the victim or perpetrator. These crimes of international concern are (a) piracy; (b) slavery; (c) war crimes; (d) crimes against peace; (e) crimes against humanity; (f) genocide; and (g) torture. Spain implemented this principle in 1985 in its own domestic statutory law by conferring such jurisdiction on its National Court for certain crimes, including genocide; terrorism; and any other crimes under international treaties or conventions that should be prosecuted in Spain. The March 2014 amendment of this statute, among other things, restricted universal jurisdiction for war crimes to cases where the accused individual is a Spanish citizen or a foreign citizen who is habitually resident in Spain or a foreigner who is found in Spain and whose extradition had been denied by Spanish authorities. Spain’s Audiencia Nacional (National Court) in June 2014 decided to terminate its investigation of alleged genocide in Tibet because of the amendment to the statute. Plaintiffs then appealed to Spain’s Supreme Court, which in May 2015 rejected that appeal. Center for Constitutional Rights, Former Detainees and Human Rights Groups Appeal Spain’s Decision to Discontinue Guantánamo Investigation (July 23, 2015). 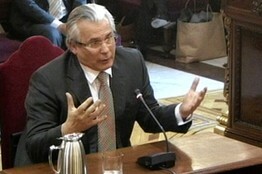 A prior post summarized the three pending criminal cases against Spanish Judge Baltasar Garzon. This month has seen significant developments in these cases. On February 8th, the trial of the Franco-era case ended with Judge Garzon telling the court that he was motivated by “the helplessness of the victims.” The decision in that case is still to come. On February 9th, Judge Garzon was convicted of the charges involving his approval of wire-tapping attorney-client communications. On February 13th the court dismissed the case about the Judge’s alleged bribery by Banco Santander. Now I have further commentary about these cases. The case that has drawn the most attention is the one with respect to Judge Garzon’s investigation of Franco-era human rights violations. Spanish citizens supporting the Judge have demonstrated in front of the Supreme Court building with signs saying “Stop the Persecution of Judge Garzon.” This obviously is only one segment of Spanish society which still has deep-seated divisions over its Civil War of the 1930’s. Moreover, these charges against Garzon have spawned at least two collateral proceedings. Garzon could not validly be punished for his reasoned interpretation of law and that the charges against Judge Garzon were threats to judicial independence. The European Court, however, is unlikely to take any action on this complaint for many months. The prior year, May 2010, the Center for Constitutional Rights and the European Center for Constitutional and Human Rights and nine other human rights organizations filed a complaint with the U.N. Human Rights Council’s Special Rapporteur on the Independence of Judges and Lawyers (and five other U.N. special rapporteurs and working groups) alleging that these criminal charges against Judge Garzon were an improper interference with the Spanish judiciary. I have not been able to find any action or report about what these U.N. entities have done, if anything, with respect to this complaint. It should be noted that this May 2010 complaint to U.N. entities was submitted before the WikiLeaks disclosure of the U.S. diplomatic cables about U.S. efforts to stop Spanish criminal cases against U.S.officials, and there was no allegation in this May 2010 complaint that the U.S. or Spanish officials improperly caused the criminal charges against Judge Garzon to be made. As reported in prior post, on January 19, 2012, two of these same human rights organizations–the Center for Constitutional Rights of New York City and Berlin’s European Center for Constitutional and Human Rights–alleged that U.S. and Spanish senior governmental officials improperly had attempted to interfere with the Spanish judges handling three criminal cases against U.S. officials. The asserted bases for the allegations were U.S. diplomatic cables released by WikiLeaks; these cables are now available on the web. The allegations themselves were set forth in a complaint the organizations filed with the United Nations Human Rights Council’s Special Rapporteur on the Independence of Judges and Lawyers. However, this recent complaint to the Special Rapporteur does not allege that the U.S. or Spain or both improperly had instigated the criminal charges against Judge Garzon. Perhaps the unstated hope of this complaint is that the Rapporteur would uncover evidence of such an improper attempt. The absence of such a direct accusation in the recent complaint to the Rapporteur is significant, in my opinion, because simultaneously with filing of that complaint, the Center for Constitutional Rights and the European Center for Constitutional and Human Rights along with seven other human rights organizations released a joint statement supporting Judge Garzon on his investigation of crimes related to the alleged crimes of the Franco regime. The statement asserts that application of international law to such crimes as was done by Judge Garzon does not constitute judicial malfeasance under Spanish law. Indeed, the joint statement elucidates the international law against the validity of amnesties for genocide, crimes against humanity and war crimes. But the joint statement did not allege that this criminal case against the Judge was the result of improper actions of U.S. or Spanish officials. There has been considerable commentary about the Judge’s conviction in the tapping of attorney-client communications that has been discussed in posts on February 10th and February 11th. The dismissal of the third case involving alleged bribery of Judge Garzon makes it unnecessary to make further comment on that case. The criminal cases against Judge Garzon are very important. First, they are obviously important for the Judge personally. Second, they are important, in my opinion, for the independence of Spanish judges from internal (or external) political opposition to judicial decisions. Third, they are important around the globe for judicial enforcement of international human rights. As mentioned in a prior post, on January 19, 2012, two human rights organizations–the Center for Constitutional Rights of New York City and Berlin’s European Center for Constitutional and Human Rights--alleged that U.S. and Spanish senior governmental officials improperly have attempted to interfere with the Spanish judges handling three criminal cases against U.S. officials. These allegations were in a complaint the organizations filed with the United Nations Human Rights Council’s Special Rapporteur on the Independence of Judges and Lawyers. Now we examine the specifics of these allegations. Afterwards we will take a quick look at the role and function of the Special Rapporteur to understand the context in which these accusations are being made. The complaint to the Special Rapporteur alleges that U.S. officials have breached the right to an independent and impartial judiciary by interfering with the exclusive authority of the Spanish judiciary to determine these cases without restrictions, improper influences, pressures, threats or interference. These actions by U.S. officials allegedly sought to deprive victims of serious crimes, including torture, of the right to an impartial proceeding and the right to redress. With respect to Spanish officials, it is alleged that they improperly cooperated with the U.S. officials and that the Spanish prosecutors breached their legal duty to act fairly and impartially. The U.S. officials who were involved in these communications were the U.S. Ambassador to Spain, two Republican U.S. Senators (Judd Gregg of New Hampshire and Mel Martinez of Florida) and U.S. diplomatic staff in Spain. The Spanish officials who were so involved held various positions in the government’s executive branch, including the Vice President, the Foreign Minister, the Attorney General and the Chief Prosecutor along with lower-level people in the Spanish government. Very significantly, in my opinion, there is no mention in the complaint of U.S. or Spanish officials’ allegedly communicating directly with the Spanish judges who were involved in these three cases in any way. There is no allegation that the U.S. or Spain threatened the judges or tried to bribe them to halt the cases. Nor is there any claim that the Spanish officials had improper and ex parte communications with the judges. In many of these communications, the Spanish officials stressed that the Spanish judiciary was independent of the government, and I think that the previous summaries of these three cases demonstrates that independence. The complaint to the Special Rapporteur, however, argues, in my opinion, that these Spanish statements show that all participants were aware that their communications were improper. I do not find this argument persuasive. The substance of the communications was the U.S. extreme displeasure with the Spanish courts’ processing these cases and the potential adverse consequences for the overall U.S.-Spain relationship from continuation of the cases. The U.S. kept pressing the Spanish officials to try to stop these cases, but the consistent Spanish response was their inability to control that decision because the courts were independent. Moreover, as we have seen in prior posts, the three cases continue to be processed by the Spanish courts. The cases are not over. I am not an expert on U.S. or other countries’ diplomatic practices, but these communications are what I would expect to occur when two countries have a problem. Diplomats and other officials for one country express their displeasure with something the other country is doing and try to persuade that other country to change its behavior. Therefore, although I regard myself as an international human rights advocate and want these cases against U.S. officials to proceed on the merits and although I have great respect for the two human rights organization pressing this complaint, I am not persuaded there was improper conduct by the U.S. or Spain as alleged in the complaint. Here especially I invite comments indicating I may have missed or misinterpreted some of these diplomatic cables or their significance for this complaint to the Special Rapporteur. In a subsequent post I will discuss the Spanish criminal charges now pending against Judge Baltasar Garzon, who was a judge in two of these cases against U.S. officials and whether the charges against the Judge are related to the alleged U.S. and Spanish improper attempts to interfere with the Spanish judiciary. In 1994 the U.N. Commission on Human Rights created this position after it noted “the increasing frequency of attacks on the independence of judges, lawyers and court officials and the link which exists between the weakening of safeguards for the judiciary and lawyers and the gravity and frequency of violations of human rights.” The initial period for this position was three years, but it has been extended by the Commission and since 2006 by its successor, the U.N. Human Rights Council. The term “rapporteur,” by the way, is a French term that is used in international and European legal and political contexts to refer to a person appointed by a deliberative body to investigate an issue or a situation. The complaint to the Special Rapporteur and the Spanish criminal cases against U.S. officials and against Judge Garzon are important unfinished matters. We all should make special efforts to stay abreast of further developments, especially since the U.S. media does not provide persistent coverage of these matters. As discussed in a prior post, under customary international law and certain treaties, a nation state has universal jurisdiction over certain crimes of international concern regardless of where the crimes were committed or the nationality of the victims or perpetrators. These crimes of international concern are (a) piracy; (b) slavery; (c) war crimes; (d) crimes against peace; (e) crimes against humanity; (f) genocide; and (g) torture. Spain has implemented this principle in its own domestic law and has invoked it in significant cases, including the attempt to prosecute Augusto Pinochet, the former President of Chile, for alleged human rights violations in his home country and Spain’s pending prosecution of former Salvadoran military officers for the November 1989 murder in El Salvador of six Jesuit priests and their housekeeper and her daughter (the Jesuits case). We also have seen that torture is illegal under international law and that the U.S. is a party to the multilateral treaty against torture. As a result, the U.S. has submitted reports about its compliance with the treaty to a U.N. committee. Another case is against six members of the George W. Bush Administration who were involved in drafting legal memoranda that allegedly facilitated the torture of detainees at Guantanamo Bay and other U.S. detention facilities around the world (the so-called “Bush Six” case) . The third case concerns the killing of a Spanish journalist-cameraman in Baghdad, Iraq on April 8, 2003, by a U.S. tank’s firing on a hotel where the man was staying. Each of these three cases will be the subjects of subsequent posts. On January 19, 2012, another front in these battles was opened with the filing of a complaint with the United Nations Human Rights Council’s Special Rapporteur on the Independence of Judges and Lawyers. On the basis of U.S. diplomatic cables released by WikiLeaks, the Center for Constitutional Rights of New York City and Berlin’s European Center for Constitutional and Human Rights alleged that U.S. and Spanish senior governmental officials improperly have attempted to interfere with the judicial process in these three cases. This important development also will be discussed in a subsequent post. The issue of judicial independence under international law is currently being litigated in a case against Ecuador.